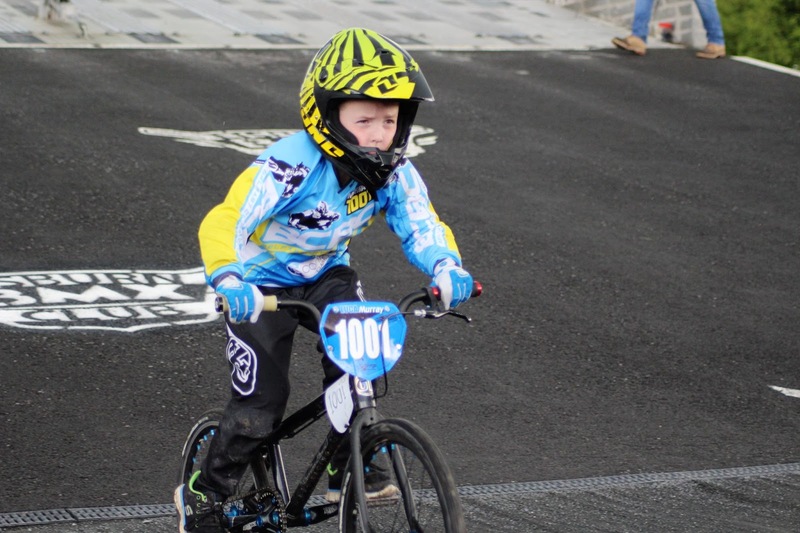 Sunday 4th June saw the Irish National BMX series move north to the immaculately prepared and technical track at Lisburn BMX in Lambeg. The weather made no promises to behave but the racing was always going to deliver. BCBC were there early setting up in a prime spot which gave us a great view of the best of the action with the new addition of an upgraded gas barbecue staffed by the fastest BMX riding burger flipper in Ireland. The bikes, bodies and minds of our 19 BCBC riders were prepared to do battle against the best in the country. Some of our newest riders were facing their first National race whilst other were over 30 years from their inaugural race meet, but I'm not sure who was feeling the nerves more! Kicking off the show were the mini rippers in the under 6s. We are missing our mini superclass rider, Jamie Harron, at the moment out with injury but Ruarcc Sheridan, on his first outing stepped in and flew the flag for BCBC. What a debut! 4/3/5 and a 7 th in the A final. Great result with more to come from this guy! Next up we're the 7-8 boys, a tough class with elbow to elbow racing from front to back, this didn't faze BCBC's Ruben Falls who battled hard for every place getting a solid 8th in the B final, getting faster every race! The next class of 9-10 boys had such a big turnout there were three sets of motos to cover the 22 riders out. BCBC Were well represented with Luis Reid leading the charge, pushing hard all day Luis narrowly missed a podium place with a 4th overall on the day. It's only a matter of time. Also going strong was Andre Aroga with a win in one of his motos earning him a well deserved place in the A final place and 6th overall, this kid has got power and will only get quicker. Ozzy Doherty was next through riding strong in his motos and finishing 3 rd in the B final. Three more BCBC riders have also started their racing careers in this class, Luca Murray, Jamie Duggan and Carter Magill are only on the first or second races and are riding with all the confidence of the pros. Luca finished 6th and Jamie 8th in their final, hard earned in the toughest class out there. Carter Magill was going brilliantly too but crashed hard and sat out his last races. We look forward to his comeback at the next race. The 11-12 boys were up next and these guys are great to watch! Contested by Nicholas Wilkinson and Martin Groundwater these kids have speed and skills. Both BCBC riders were at the pointy end of the action with Nicholas pushing hard to the line for his first podium. Martin was hot out of the gate but got caught up in a first jump crash and did well to finish the race in 7th. With all the boys done and dusted it was time for the proper hard racers to be wheeled out, the girls! Lucy Groundwater was out first in a tough class. Lucy kept the hammer down in each of her motos finishing 5 th overall with her trademark grin ever present. Does anyone enjoy their racing more? Meg up next with three motos and a final this time instead of the normal 4 motos. With 2/1/2 and a 2nd in her final she holds on to her 2nd place in the championship. Molly was out next her new much admired Yess for its debut race and she has it dialed from the off. This class has just got faster with every meet. Molly stepped it up a gear and finished 5 th overall. On to Stuart in the 15 plus males contending not just with the usual suspects but with two rogue superclass riders in the mix. Stuart's strong technical skills work well around the Lisburn track and he finished 6 th in his A final. Moving now on to the less attractive classes of the day, first out we had Peter Jamison in the masters 40 plus. Pete rode hard to get finish with 5/5/4 in his motos and a win in his run off to take a well deserved place in the A final. Unfortunately he had a little nap on the gate and got his worst start of the day, too many fast boys in this class for second changes and Pete finished 8th in the As, no Shame in that! Next up was BCBC's second favourite 30 plus cruiser rider, Ian Hamilton. Strong in his motos Hammy was well positioned for the win with a 3/1/1. Unfortunately a combination of too much coffee, a vegan lunch and not talking to his trainer about what gates he had combined to cause phantom beeps in his head and he went off like Forrest Gump running down the hill a good two seconds before the gate dropped! This resulted in an 8th place with the only saving grace being that he took his main rival Brian Mallon with him! Overall a fantastic day was finished off with the best race of the day featuring our top two BCBC riders Jacob Jamison and Reece Hamilton taking 1st and 2nd in the striders. Superb, these guys are the future!